2006: Horse racing at Caymanas Park. One of the world’s oldest sports and one of Jamaica’s most popular, horse racing dates back to 4500 BC when nomadic tribesmen from Europe to Asia first began to race domesticated horses. The Romans loved chariot racing as did the Egyptians who also enjoyed mounted horse racing, both of which by 638 BC were included in the Greek Olympics. Modern racing emerged in the 12th century and betting became a popular diversion of European nobility. During the 1700s, racecourses were a common sight in English towns and villages. The Jockey Club was formed in 1750 to lay down rules and regulations and bring some order to the sport. Breeding began to produce faster and sturdier animals to supply the demand. British settlers brought horses and horse racing with them to their colonies beginning in the 1600s. It became a regular sight to see horses and buggies lined up in races along city streets, farm fields and country roads. Horses first arrived in the New World with Columbus who took them first to Hispaniola in 1493. Horses are said to have landed in Jamaica in 1509 with the settlers at New Seville. It is said that when the English took Jamaica from the Spanish in 1655, the island was replete with wild horses so much so that one admiral referred to them as the “very vermin of the country” (as quoted in Senior, 2003, p. 235). This was the result of a fal-off in export as horses began to be bred in the Spanish territories in mainland South America (Senior 2003, p. 234). It did not take horse racing long to catch on in Jamaica. Volume 1 of the English Stud Book lists the earliest importation of stock from England for racing in 1777 and an 1816 racing record notes that Jamaica meetings featured prominently in the racing calendar. The earliest races were held on the savanna west of the then capital Spanish Town but it was not long before every parish had a racecourse. Race days were days of celebration – occasions for women to dress up as there were balls and dances every night of the five-six day tenure of the events. The purses were generally raised by public subscription and amounted to £100. Kingston meetings lasted from Monday to Saturday and there were 12 purses, two run each day. During slavery, the best jockeys were slaves and certain plantation owners became known for importing European stock and becoming champion breeders such as, the Scotts and Montcreiffes at Friendship and John Blagrove of Cardiff Hall Estate in St. Ann. Jamaican-bred race horses were highly prized because of their repeated success against horses from other countries. As such they were in great demand and large stud farms developed in St. Elizabeth and St. Ann. Jamaica became known for having excellent land for breeding horses and Jamaican horses were exported to build up the racing stock of many countries in Central America. 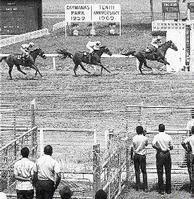 FILE POTOS – 1969: Lal Bahadur (Dave Ranguet) is seen scoring an upset over the favourite Bassinet (Herberto Castillo) in the ‘E’ class 61/2 furlongs at Caymanas Park on Saturday Aug. 20. The seven-year-old bay gelding won at 25-2. In Kingston, the importation of horses for breeding and racing purposes goes back to the 1700s and organised racing started in the 18th century. The first race course was laid out in 1783 in the north of the city. Over time, the races came to involve much more than the races themselves. There was a ritual parade of horses from Harbour Street through commercial Kingston to the racecourse where trial heats would take place in front of large enthusiastic crowds. Yet the first race with a purse did not take place at Kingston Racecourse (now National Heroes Park) until 1816. The purse totaled £100. Races were held annually until the outbreak of World War II. Early in the 20th century the racecourse was moved from today’s National Heroes Park to the onemile, chainwide track at Knutsford Park. Knutsford Park Limited was established to promote racing in 1904 and it controlled the industry for two decades, after which its first competitor, Jamaica Turf Club Limited, emerged. The first race at Knutsford Park Racecourse was held in 1905 and the last in 1958, when Jamaican racing moved to its present home of Caymanas Park. Knutsford Park became the commercial business hub now known as New Kingston. Racing is said to have hit its high point in 1840 when meetings were held in Trelawny, St. James, Old Harbour, Bath, Westmoreland, Manchester, Clarendon, St. Elizabeth, St. Mary, St. Ann, Spanish Town and Kingston. (Jamaica Stud Book, Volume 1, p. xxi). A former sugar estate owned by Alexander Hamilton, the track was designed by Bartolomeo Vicens-Oliver and was destined to change hands many times over the years until it eventually went bankrupt in the late 1980s. The Government stepped in in 1989, forming Caymanas Track Ltd. (CTL) to oversee the 196-acre plant and its assets. Under the chairmanship of Danny Melville, improvements were made, including the installation of a multimillion-dollar totaliser system and the implementation of the claiming system – a different type of racing that involved a computerised off-track betting system. An audio-visual microwave network for the corporate area was also established, and to add to the excitement, more exotic bets were made available to punters. An exotic bet is any bet involving anything other than one horse such as an Exacta (first and second), Trifecta (first, second and third) and Superfecta (first through fourth). In March 1990, CTL began to show Simulcast Racing from Florida and has since expanded to include New York, California, Arizona, and Philadelphia, among other locations. In 1994, CTL expanded to Britain and in 2000, to Australia. Today, Caymanas Track Limited counts the following associations: The Jockey Club of Jamaica, The Jamaica Racehorse Owners and Trainers Associations, The Thoroughbred Breeders and Owners Association of Jamaica, The Jockeys Association of Jamaica, The Grooms Association of Jamaica, and The Bookmakers and Independent Bookmakers Associations. The Jamaica Jockey Club was also formed in 1905. Over the years, the Jockey Club has been credited with introducing patrol cameras and photo finishes and even sending people to prison for tampering with races. The club also stages the annual Jockey Club Stakes for three year olds. In 1972, the Government of Jamaica by act of Parliament established the Jamaica Racing Commission, creating a new legal structure to regulate and control horse racing and the management of Caymanas Park. As a result, the Jockey Club now serves as a repository of racing history and its members, known as stewards, meet regularly to discuss challenges to the industry. They also enjoy a special grandstand area at Caymanas. Many Jamaican jockeys have had success in North America, including Richard DePass who once had the record for the most winners in one day in the Guiness book. In addition, George HoSang won many championships in Canada. Charlie Hussey was the regular rider of Spend A Buck when he ran at Calder in Florida – a horse that later won the Kentucky Derby with a different jockey. Winston Thompson has won many races at Suffolk Downs in Boston and Tampa Bay Downs. Andrew Ramgeet is a leading jockey at Mountaineer Park in West Virginia. Barrington Harvey wins races on the west coast with regularity, especially on the fair circuit during the summer. Shane Ellis, the son of former champion jockey Winston Ellis, is a leading jockey in Canada. These are only a few. Hundreds of Jamaicans are employed as exercise riders and grooms in the U.S. and Canada and are given rave reviews by their employers. As a matter of fact, Winston Ellis, who has worked for Hall of Fame trainer H. Allen Jerkens as an exercise rider for many years, is considered by his employer to be “the best in the business” and has been an integral part of the preparation of his many champions. There have been few Jamaican horses that have competed on the international level. Perhaps the best was Thornbird, trained by Wayne DaCosta, who ran very well in the Caribbean Classic in Puerto Rico several years ago. As an industry, horse racing employs upwards of 20,000 people from jockeys to breeders, to trainers to bookmakers, grooms, and track employees (Lalor, 2006). Jamaica continues to dominate the production of horses in the Caribbean region and has produced a number of Hall of Fame trainers: Ralph Ziadie, Nigel Nunes, Kenneth Mattis, Billy Williams, Owen Silvera, Philip Feanny and Laurie Silvera to name a few. Classic racehorses such as None Such, Rameses and Legal Light are well known to racing fans. Interestingly, strong sires such as Zaleucus, Royal Minister and the Peace Maker are generally imported This is a market decision. Most of the breeders want to breed imported stallions. The economics of the game and the deterioration of the physical plant and racing product have made it uneconomical to import quality stock to Jamaica. Popular interest in racing is tied to the general love of gambling and the implementation of a sweepstakes, the outcome of which was used to benefit hospitals, and the development of racing itself only added to the attraction. The “sweeps” soon made its way into popular culture becoming a feature in song and folklore. Perhaps the best-known song in which horse racing imagery is featured is 1968’s Long Shot Kick the Bucket by the Pioneers, in which a horse with great stamina captures the public’s imagination, even though he is not a champion. The first lady of Jamaican poetry, Miss Lou, wrote a poem called Sweepstake in which a bettor turns to obeah for luck, wrapping up the sweepstakes ticket in nunu bush (used as a substitute for basil) which is believed to ward off evil spirits. (Senior, 2003, p. 256, 353). This entry was posted in History and tagged Jamaican Horse racing History The sport of kings. Bookmark the permalink. It is one of the most ancient of all sports. horse racing plays an important part of myth and legend, such as the contest between the steeds of the god Odin and the giant Hrungnir in Norse mythology. Archaeological records indicate that horse racing occurred in Ancient Greece, Babylon, Syria, and Egypt. In most horse races, entry is restricted to certain breeds; that is, the horse must have a sire (father) and a dam (mother) who are purebred individuals of whatever breed is racing.